Do you think you could learn to read tarot once-and-for-all with confidence – in just three minutes? 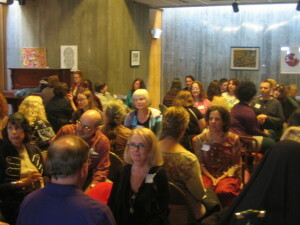 We have been teaching people to read tarot in ten minutes for over six years – but we still thought that took too long. 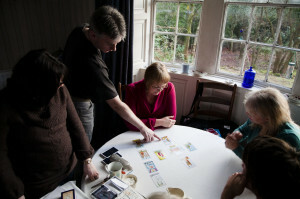 Marcus Katz Teaching Tarot with Mary K. Greer and Rachel Pollack in 2011. So over the last two years we have developed a new method which will guarantee you can read any card in any deck for any question in any spread – in THREE MINUTES. We have tested this ground-breaking new method with hundreds of beginners and refined it to work with every learning style. It got an amazed reaction when we taught the finished version at TarotCon (Germany) last month and we are now ready to release it. 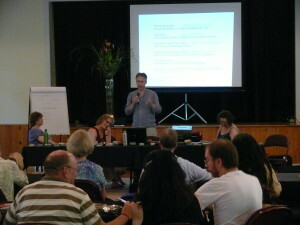 Marcus Katz teaching tarot in the US, 2010. This is an ideal video class for all nervous beginners or even experienced readers wanting a totally new way of approaching tarot for themselves or their students. We have been using and teaching tarot for over thirty years, and have developed this method by working with the world’s leading tarot readers and teachers. 1. The class (1 hour pre-recorded video + PDF handout) is $35. 2. If you cannot read every card for any question, past, present and future by the end of the hour using our 3-minute method, we will give you your money back. The class starts with the 3-minute method, to get you reading straight away. When you have this new confidence, we will provide 10 minutes of taking you through examples of the method. We will then show you for 20 minutes how to apply the method to different decks and cards. You will then apply the method for 20 minutes to a nine-card reading, past-present-future, which provides a practice for you to continue with the method after the class. A summary for 7 minutes then shows how the method was created and how to use it to read with any number of cards. When you have registered with the Paypal payment below, you will receive a personal login within 24 hours for the class video.